My Fur Lady. The McGill University ‘Red and White Revue’ for 1957. It proved so popular that it toured Canada 1957-8; a total of 402 performances were given in 82 centres. Its book was written by Timothy Porteous and Donald MacSween, and its lyrics by Porteous to music by James de B. Domville, Galt MacDermot, and Harry Garber. Roy Wolvin contributed additional songs, Edmund Assaly wrote the orchestrations, and Brian and Olivia Macdonald were responsible for choreography. The revue was premiered 7 Feb 1957 in Montreal by McGill University students. Discontinued briefly while the cast returned to its studies, it reopened 23 May 1957 in Montreal under the auspices of the McGill University Graduate’s Society, then played at the Stratford Festival as a fringe attraction before beginning its national tour. A satirical look at the Canadian Establishment, My Fur Lady recounts the search of Princess Aurora Borealis (the contralto Ann Golden) of ‘Mukluko’ (‘near’ Baffin Island) for a husband, in order to retain her country’s independence from Canada. The music combined 1940s sentimentality, 1950s rock, and various elements of jazz, while the lyrics reflected the political events of the times. 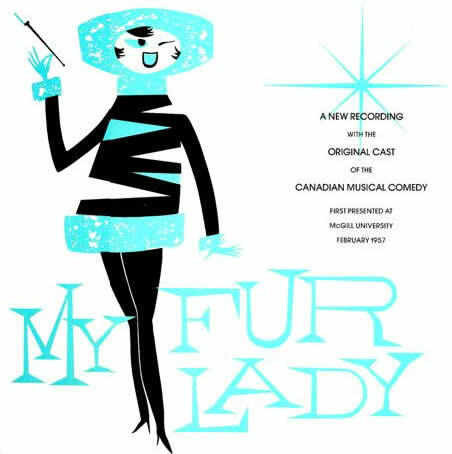 My Fur Lady was recorded 12 Jun 1957 by the original cast.